Prime Minister Manmohan Singh skipped his usual attire of pristine white to take part in a photo-op with United States President Barack Obama and the top leaders of Asia. 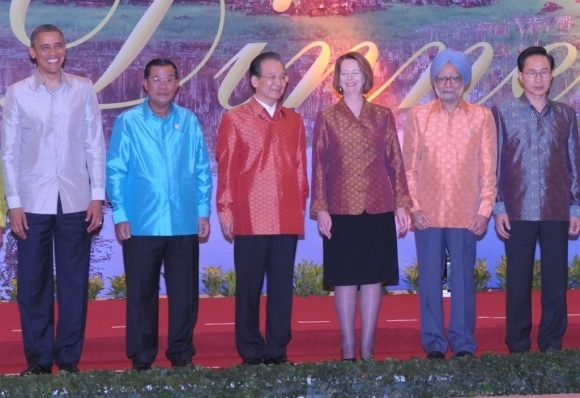 Seen in the photograph are Prime Minister Manmohan Singh with US President Barack Obama, Cambodia's Prime Minister Hun Sen, China's Premier Wen Jiabao, Australian Prime Minister Julia Gillard and South Korean President Lee Myung Bak. The photo was taken before the gala dinner for head of states participating in the 21st ASEAN and East Asia summit in Phnom Penh. 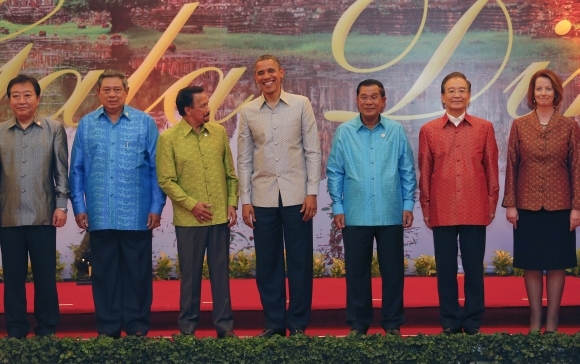 US President Barack Obama is all smiles as he poses with Japan's Prime Minister Yoshihiko Noda, Indonesia's President Susilo Bambang Yudhoyono, Brunei's Sultan Hassanal Bolkiah, Cambodia's Prime Minister Hun Sen, China's Premier Wen Jiabao and Australian Prime Minister Julia Gillard. According to media reports, Obama held a rather tense meeting with Cambodia PM Hun Sen earlier in the day, when he discussed the country's sorry human rights record with the Cambodia premier. 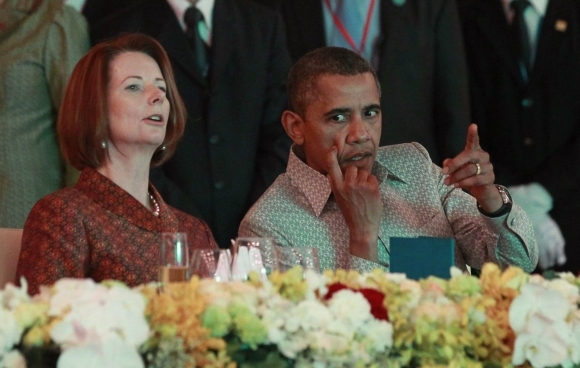 Obama shares some thoughts with Australian Prime Minister Julia Gillard. This is the first time an American President has visited Cambodia, which had remained cut off from the rest of the world for several years when it was under the rule of the tyrannical Khmer Rouge regime. 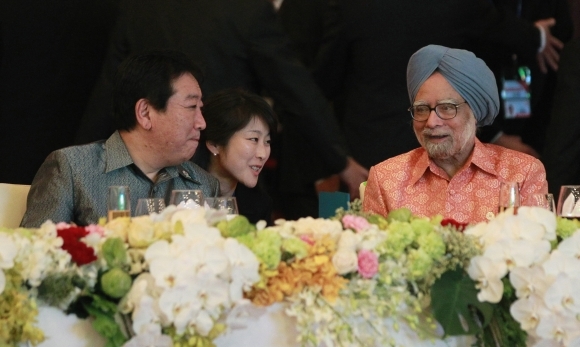 Dr Singh chats with Japan's Prime Minister Yoshihiko Noda at the East Asia summit dinner. East Asian nations will on Tuesday launch negotiations for the ambitious Regional Comprehensive Economic Partnership, a mega trade agreement comprising 16 countries of the region, including India.